A portable exhibit of the Idaho Anne Frank Human Rights Memorial featuring: select images and quotes from the Memorial; QR code links for additional audio and video information from the Memorial; and Center “Be an Upstander” and “Spiral of Injustice” messaging. The exhibit is comprised of four 24″ x 24″ x 80″ free-standing columns with 16 panels of display. 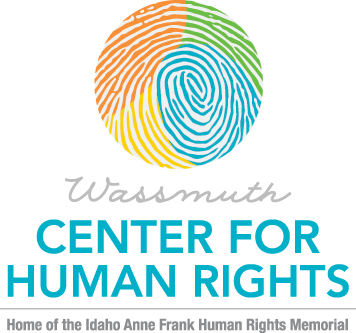 To inquire how to bring the portable exhibit to an Idaho school or community center near you, email info@wassmuthcenter.org.